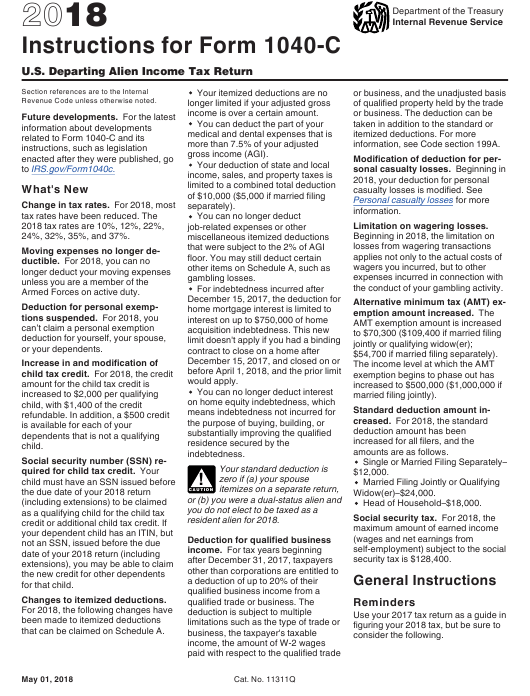 January 1, 2018 "Instructions For Irs Form 1040-c - U.s. Departing Alien Income Tax Return" contain the updated filing procedures for the IRS-issued Form 1040-C. Download your copy of the instructions by clicking the link below. IRS Form 1040-C is a tax form issued by the United States Internal Revenue Service. income is over a certain amount. information, see Code section 199A. 24%, 32%, 35%, and 37%. the conduct of your gambling activity. Armed Forces on active duty. $54,700 if married filing separately). that can be claimed on Schedule A.
to help you complete Form 1040-C.
in chapter 8 of Pub. 519.
or the substantial presence test. test, you will not be considered a U.S.
foreign earned income from tax. additional child tax credit on line 27.
and prior-year forms and instructions. income, if they are required to do so. your rights. Know them. Use them. Form 1040-C or Form 2063, U.S.
earlier year's return has not passed). A Form 1040-C is not a final return. after your tax year ends. 4. Any of the following applies. transportation line and the U.S.
who has no income from U.S.
the tax year shows an overpayment. taken into account on your final return. spouse or child of such an individual. showing wages paid and tax withheld. tax returns that have not been filed. (d) a list of any previous grants. period for which the return is made. such as an airline ticket. service is available at that office. 11. Document verifying your U.S.
not your spouse requires a certificate. a separate Part I for each spouse. and pay any tax due. out if you are eligible for one. tax returns you filed for that period. “Noncitizen” in the search box. dependents claimed on the returns. or immigration status under U.S. law. the country at any time during the day. your final income tax return. commuted from Canada or Mexico. United States at any time during 2018.
you will be treated as a U.S. resident. given the privilege, under U.S.